In the process of many industrial machinery, we will use a variety of mechanical equipment and tools, without these tools, our work can not be carried out smoothly. Roller burnishing tool is an important tool. What about the structure of roller burnishing tool? How does it work? This is what everyone is concerned about. Now let’s understand the structure and composition of the roller blade, as well as the relevant matters needing attention during its use. Roller burnishing tool adopts combined type, and different models are selected according to the length of each workpiece, number and position of annular groove. Roller burnishing tool consists of roller blade and sleeve, which is locked with nut. The entire knife body is placed in the holes of the left and right wall panels. Right and left wall board hole is open close type, namely half side hole is on wall board, another half side hole is on right and left pressing board. 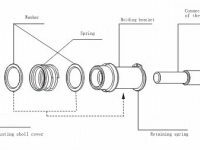 The left and right bearings are sliding bearings that are equally divided into two halves to facilitate the loading and unloading of the mounting roller blades and sleeves. The right and left press-plates press the rolling cutter body onto the wallboard and fix it with screws. The swing arm rotating shaft, driving shaft and eccentric shaft are installed on a pair of wallboard. Adopt double eccentric shaft top and right swing arm to make the work smooth. The workpiece positioning is fixed on the middle pinion shaft, which can be adjusted to make sure the workpiece is in the right position. Roller burnishing tool is made of alloy tool steel Cr12MoV and quenched to HRC58 ~ 60. The user requires the service life to be able to process 100,000 workpieces. In fact, the service life is more than 3 times as expected. The roller is made of 45 steel, hardened to about HRC45, and its working life is much longer than that of the knife. 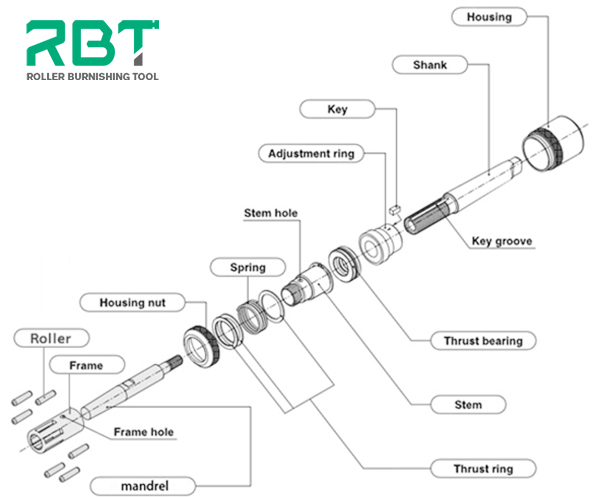 RBT roller burnishing tool has strict requirements from material selection to processing, so that the product quality can be guaranteed. If you want to buy the products such as roller cutter and roller tool, you are welcome to come to our company to choose. Our products are of good quality and the price is also very good. What are the characteristics of Skive and Roller Burnishing Tool? What is the cost performance of the inner hole chamfering & deburring tool? Address: #58 Yuandian Road, Huangyan District, Taizhou City, Zhejiang Province, China.